Sean O'Connor is the head of product at Mentored. Despite its importance, education seems to have been missed by the Internet revolution. When I walk down the hall of a middle school, not much seems to have changed since I was a student some 15 years ago. Luckily, that is changing. There are a growing number of entrepreneurs working to reshape education. Every year, thoughtful new solutions come online to solve a piece of the problem. Innovators are working hard to create students who can learn how to learn, who can think critically and who can lead. There are only 11 education-focused firms listed on the U.S. stock market with a market cap of over $1 billion. While the market is small and fractured today, GSV Capital estimates that education will grow from 9 percent to 12 percent of America’s GDP over the next decade. This equates to a trillion-dollar opportunity. Using CrunchBase, I took a look at $5.5 billion invested in 450 edtech companies over the last three years. I’ve highlighted those in this landscape that exhibit the qualities of an amazing company: a great team, an amazing product and the potential for a huge impact. When thinking about the edtech landscape, I frame solutions by the life cycle of a learner: early childhood, primary and secondary school, higher ed and continuing education. This progression helps me understand where a firm is focusing and what type of change they are trying to make. I’ve broken out each category and described the trends I see shaping the market. …and the current edtech landscape. Eighty-five percent of brain development occurs before the age of three. Today, one-third of American children aren’t ready when they start kindergarten (only 48 percent of children from low-income families are prepared, according to GSV). Starting behind in kindergarten stacks the deck against a student in life. Students who are unprepared for kindergarten are 25 percent more likely to drop out of high school and 70 percent more likely to be arrested for a violent crime. In America, 98 percent of education funding is spent after age 5. We need to question the traditional approaches to education and embrace new modes of learning to help create the next generation of leaders. Luckily, there are some great companies who are working to change this by focusing on helping parents give their children a solid educational foundation. The space is dominated by apps and gamification, which appeals to children’s natural curiosity and provides research-driven cognitive and non-cognitive activities to help facilitate development. On-demand app-based learning is a great supplement for families who cannot afford pre-K. Trend: Gamification has been the primary trend in driving engaging materials for young children. Maria Montessori realized long ago that it is crucial to meet young minds where they are, and provide them with the resources to direct their own learning. Digitally delivered content allows kids to engage in play that builds their cognitive functioning, enhances their vocabulary and increases their number fluency. FarFaria: FarFaria is a literacy tool that offers families a vast library of books that are perfect for story time. Parents can go through the books with their son or daughter, or children can have the books read to them by the app. Tinybop: Tinybop creates iOS apps that engage children and promote curiosity in kids. Their apps break down complex subjects (like geology and anatomy) into engaging apps that are filled with stunning illustrations. Vroom: Vroom is a new app that pushes helpful tips to parents on how to turn everyday moments in life into brain-building opportunities. Vroom sends parents actionable tips and strategies that are age-appropriate for their child. Tinkergarten: Tinkergarten helps kids develop and grow through outdoor-play-based learning and activities. They have a technology-enabled, distributed workforce that allows them to expand their classes across the United States. The modern school was developed shortly after the civil war, originally known as the common school. Horace Mann, who was a superintendent in Massachusetts, financed a trip to Prussia and modeled the common school after their paramilitary system. Building a person’s character was just as important as reading, writing and arithmetic. By instilling values such as obedience to authority, promptness in attendance and organizing the time according to bell ringing helped students prepare for future employment. The common school was built for everyone. It was open to all races, classes and backgrounds. It taught a common curriculum to every student. It was designed to process thousands of students and get them to a base level of competency. It was the era of mass production’s answer to educating a mass of students to prepare them to enter the workforce. For technology to disrupt our schools, we need to get them connected. But the era of the assembly line is over. We are in an age of mass customization, fueled by technology. Seth Godin recently asked, “What is school for? If you’re not asking that, you’re wasting time and money.” We need to question the traditional approaches to education and embrace new modes of learning to help create the next generation of leaders. High-school dropouts are three times more likely to be unemployed and eight times more likely to end up in prison than their peers who complete school. Eighty-three percent of American students from high-income families graduate from high school, but only 51 percent of low-income students will complete their secondary education. In 2000, only four states had 50 percent or more of their students from low-income families; by 2013, more than 20 states fit into this category. If the past data holds true, we are going to be faced with a ballooning portion of the population who is unprepared to enter the workforce, despite the increase in spending on education. In America, the average spending per student for K-12 education is $11,000 per year, more than almost every country in the world. Despite the large budgets, American students ranked 36th in global aptitude. Only 16 percent of U.S. K-12 students have access to a laptop or tablet on a 1 to 1 basis. And although 95 percent of schools have Internet, only 20 percent have high-speed access. For technology to disrupt our schools, we need to get them connected. Trend: One of the major developments in primary and secondary education is the focus on personalization. Students get pushed material that meets them where they are, when they need it. Classes can now adapt to a learner’s needs and provide them with the skills, the instruction and the resources they need to master concepts. AltSchool: AltSchool was started in 2013 and is rethinking the way school works. Their technology platform enables teachers to create weekly “learning playlists” for each student. They’ve done away with formal classes and focus on group projects and individualized instruction. CK-12: The CK-12 Foundation serves tens of thousands of schools and millions of students by providing free customizable learning tools and content. Students can use their interactive simulations and adaptive problem sets and teachers can customize their flexbooks. DreamBox: DreamBox powers more than 5 million math lessons every week through their adaptive K-8 math platform. The platform continually assesses a student’s strengths and weaknesses to close gaps and meet students with the right material at the right time. Trinket: Trinket lets teachers and students write, run and share code from any device. Trinkets can be easily adapted to the classroom and shared with students to run real-time coding challenges. College is expensive in America; the average cost is more than $20,000 a year for a four-year degree. At least 65 percent of the 55 million new jobs forecasted for the next decade will require a formal post-secondary credential. In 2015, only 50 percent of college graduates were working in the field they studied, and more than one-third indicated they would have chosen a different major. Nearly 40 percent of college graduates believed their school did not prepare them well for employment. Students are going to university because it is “the right thing to do,” often without a thought to the ROI on their education or the work opportunities after school. Only 19 percent of full-time college students graduate in four years, which dramatically increases the cost of their degree. Trend: Online platforms are being leveraged at universities to help drive down the cost of a degree and increase access to programs. Big data platforms are being used to identify students in danger of failing and provide targeted assistance to help them graduate on time. Rafter: Rafter is redesigning textbooks at universities by repackaging course materials. They’ve helped almost 3 million students save more than $700 million on textbooks. 2U: 2U offers schools as a service by providing universities with a platform to create online degree programs. They have more than 500 faculty, 1,000 course sections and 1,600 hours of live instruction per week. Recent graduates are now looking at the Return On Education as a measure of quality and to judge the cost of the investment. Learning doesn’t end when school does. In the digital economy, continual education is essential. Millennials are projected to have an average of 15 careers during their lifetime. Many jobs are being automated by robots or artificial intelligence; workers in the modern economy will have to continually adjust. Trends: The two largest sectors for investment are skill training (primarily coding and digital literacy) and English language learning. Degreed: Degreed provides a personal knowledge portfolio that stays with learners. They’ve cataloged 250,000+ online learning courses and 3 million-plus informal learning activities. They also help large companies understand the talent and skills within their organization. Duolingo: Duolingo is a gamified language learning app that has more than 100 million users. They offer free instruction and are helping non-native English speakers certify their skills with affordable online testing. Pathgather: Pathgather is an enterprise LMS that motivates employees to learn and connect around professional development. iTutorGroup: iTutorGroup is a Chinese-based English language platform that began by offering English language training to corporate executives and has expanded to offer online courses for children and younger learners. They recently raised a Series C valuing them at more than $1 billion. One Month: One Month offers technical-skills crash courses designed to give learners functional skills in 15 minutes a day for one month. Since starting, they’ve helped more than 25,000 students develop foundational technical skills. altMBA: altMBA is an intensive, four-week online workshop designed by Seth Godin for high-performing individuals who want to level up and lead. They are rethinking the structure of learning online and have seen a 98 percent completion rate for their program. Over the past several years we’ve seen the rise of the modern edtech industry. 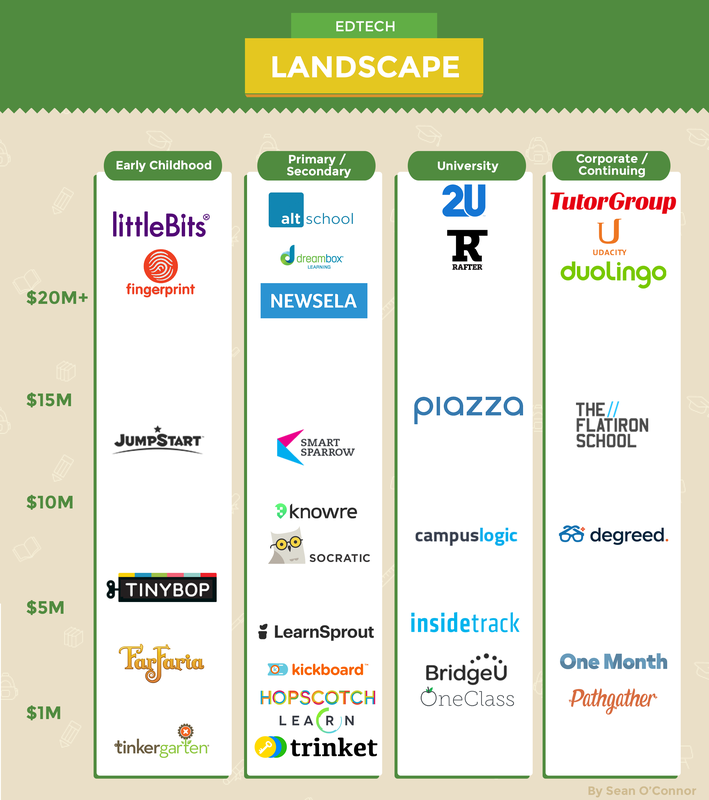 There have been massive investments in the space, and the success of these firms will dictate the future of the edtech landscape. More successful exits (like Lynda) will help to propel the industry forward. Investments in the first generation of edtech have also made it difficult for the second generation of companies to attract investment, as investors have been watching this first cohort closely to gauge results. The trends that will shape the market over the next 3-5 years are mass customization, certification, and lifelong learning. Primary and secondary schools will continue the trend toward becoming more adaptive and delivering personalized instruction to meet students where they are. There is a huge need for private/public partnerships to innovate solutions that will help provide low-income students with improved outcomes. Personalization will enable every student to get the content they need, when they need it. With the rise in adaptive curriculum, it will be important to help students realize the why and not just the how. Students, at every stage of the learning life cycle, need to see the value in their learning. Content is now widely available, and open to everyone. With the democratization of content comes new challenges in determining who is qualified to do what. The tech industry has already seen the rise of badging, nano degrees and certifications. Over the next five years this will spread into other fields and become a common trend. Credentials will become a currency. Learning doesn’t end when school does. Innovative companies realized long ago that learning is a benefit, as motivated employees want to invest in themselves. Randall Stephenson, the CEO of AT&T, recently said “there is a need to retool yourself, and you should not expect to stop.” He continued to say that people who don’t learn for 5-10 hours a week will become obsolete. Continual learning will help employees keep pace with the changing tech landscape, and will keep them engaged in their work. Thanks to David Blake (Degreed), Vipin Chamakkala (Work-Bench) and Elliott Hauser (Trinket) for sharing valuable feedback. Note: Sean is the head of Product at Mentored.com and has coached for altMBA.